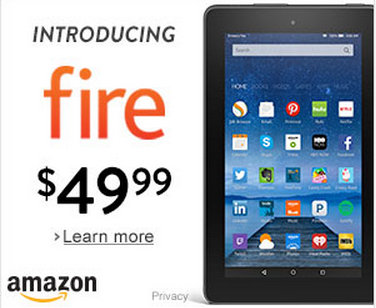 The new $49.99 Fire Tablet from Amazon will be released on September 30, 2015. It ships from and is sold by Amazon.com, and gift-wrap is available. 7-inch IPS display and fast 1.3 GHz quad-core processor.Rear and front-facing cameras.Free unlimited cloud storage for Amazon content and photos taken with Fire devices.8 GB of internal storage.Add a microSD card for up to 128 GB of additional storage.Updated user interface – Fire OS 5 designed for quick access to your apps and content.Up to 7 hours of reading, surfing the web, watching videos, and listening to music.Stay connected with fast web browsing, email, and calendar support. Storage: 8 GB of internal storage (5 GB available to user).Add microSD card for up to 128 GB of additional storage. Battery Life: Up to 7 hours. Charge Time: Fully charges in under 6 hours. Ports: USB 2.0 (micro-B connector). Audio: 3.5 mm stereo jack and integrated speaker. Content Formats Supported: Kindle (AZW), KF8, TXT, PDF, unprotected MOBI, PRC natively, Audible Enhanced format (AAX), DOC, DOCX, JPEG, GIF, PNG, BMP, non-DRM AAC, MP3, MIDI, PCM/WAVE, OGG, WAV, M4V, MP4, AAC LC/LTP, HE-AACv1, HE-AACv2, MKV, AMR-NB, AMR-WB, HTML5, CSS3, 3GP, VP8 (WEBM). Camera Specs: VGA front-facing camera. 2 MP rear-facing HD camera.